Our trademark attorneys utilize the latest CORSEARCH technology to sift through and examine thousands of state and federal trademarks so that our clients can avoid the hurdles of claims of likelihood of confusion. CORSEARCH, unlike popular internet search engines, the Trademark Electronic Search System (TESS) or other free, public-access software, possesses unique tools to identify and locate similar or duplicative trademarks that may cause confusion. CORSEARCH can even provide results for abandoned, cancelled or inactive trademarks so that clients can be aware of the problems that similar trademarks and trademark owners faced. At other times, CORSEARCH can shed light on the legal solutions that helped similar trademark owners overcome relevant registration obstacles. Our comprehensive trademark search report can provide clients with a valuable estimate of the potential risks and challenges of filing their desired mark. 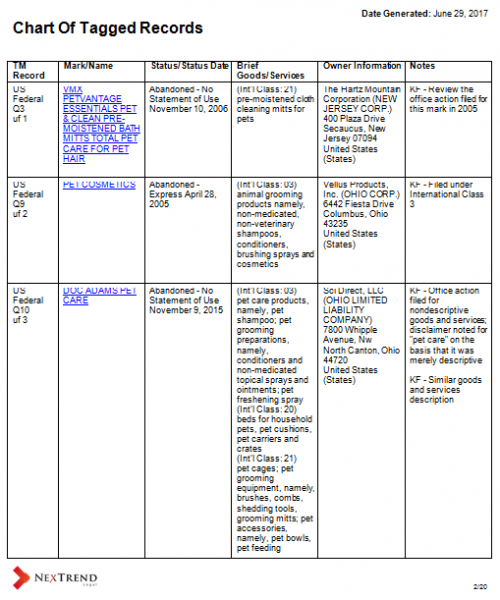 The first page of the analysis indicates the phrases and terminology that was searched during the clearance process. It also provides the number of hits with each search term so that clients can understand which phrases may be unique and trademarkable and which phrases are common and difficult to register. 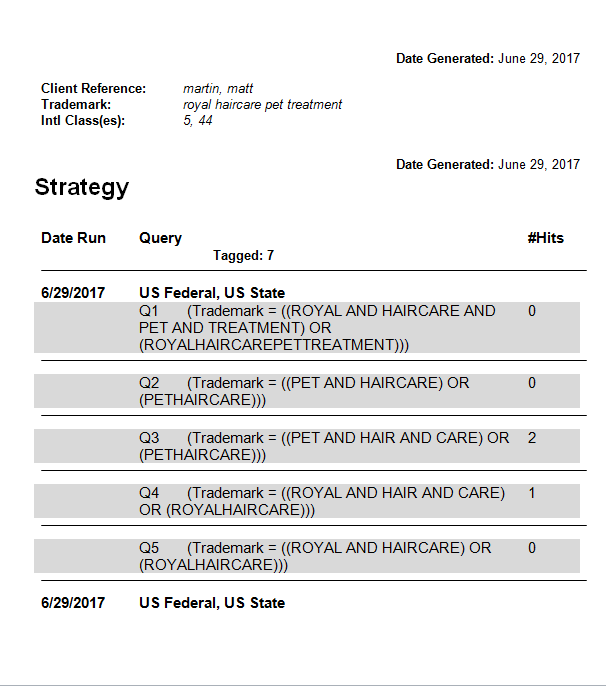 The second and third featured pages show a portion of the “Chart of Tagged Results” which provides clients with a concise summary of relevant trademark. 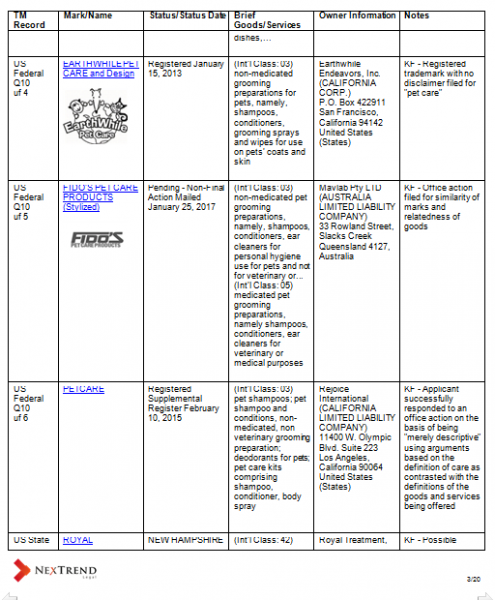 Some of these trademarks may be currently registered marks that we believe could cause conflicts with likelihood of confusion claims. 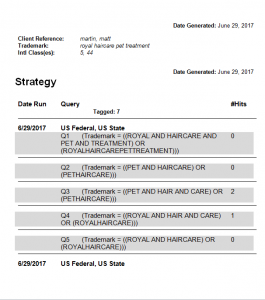 Other tagged trademarks in this chart may have useful insight on overcoming registration issues that we believe the client could potentially face. Meanwhile, the fourth page provide an example of a breakdown of one of the tagged results. These pages provide a detailed review of the registration process of similar or related trademarks. 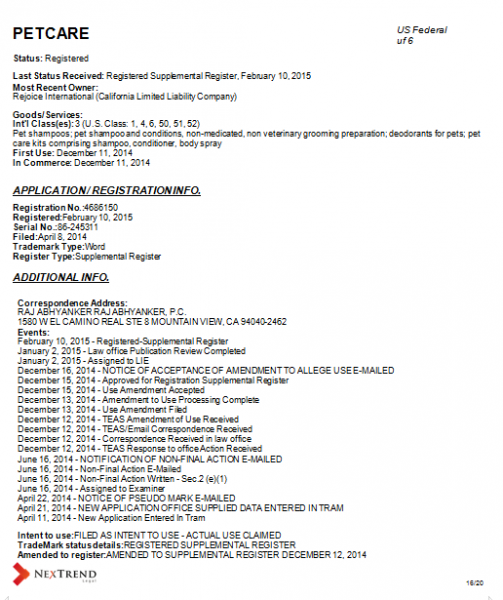 These pages can help a client avoid the mistakes of past trademark owners and understand what registration for a mark with their goods and services may look like. 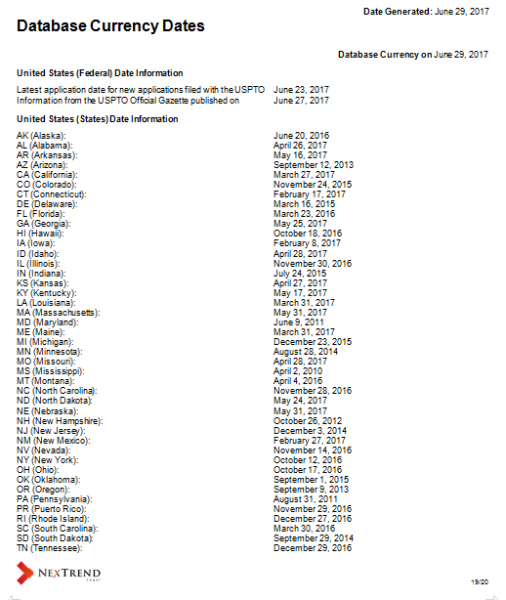 The final page shown in this slide reveals the database currency dates. This page acts as a documented reference of the currency of the state and federal databases that were search. Once a proper search has comprehensively analyzed existing trademarks, our law firm provides a memorandum of our results so that our clients can then begin discussing potential issues. In many cases, these results can serve as a useful quantitative risk management tool. A preemptive clearance search can also save a business from wasting months of time on an unexpectedly improper trademark. A clearance search also usually tends to outweigh the initial cost for a trademark owner by saving them money through avoiding the legal fees of ownership battles with owners that possess similar marks.